Froodle by Antoinette Portis | What is ML Reading? When ML was a preschooler, she loved to make up words. She still does. 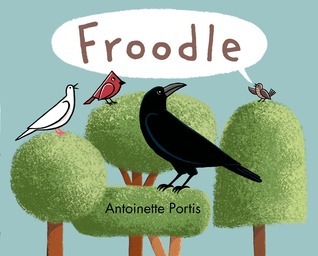 When Froodle by Antoinette Portis showed up at the library, I knew ML would love it. It was perfect timing. Last week in the post Dear Ms. Shaw, Sorry ML was late I wrote about ML’s fascination with birds. Currently, there are three teeny tiny sparrow eggs in our birdhouse. The book highlights all the places we see birds at our house… resting on the power lines, hiding in the bushes, singing from the trees, perched on the neighbor’s for rent sign and peeking over our side door awning. The combination of silly words and perceived personalities of various types of birds amuses. It’s hard to pick a favorite silly word from the book when it includes words like snoobly, zickle, itsy boggen, zinker triggy, pleemish and many more. We’re looking forward to hearing our little brown sparrows when they hatch. What do you think they will say? This entry was posted in Picture Book and tagged Antoinette Portis, Froodle by mlreads. Bookmark the permalink.